Plantation owners used records such as slave bills of sales, birth registers, and many other documents to keep an accurate count of their slaves’ births, deaths, and their production on plantations and farms. These documents are invaluable in tracing African American genealogy. 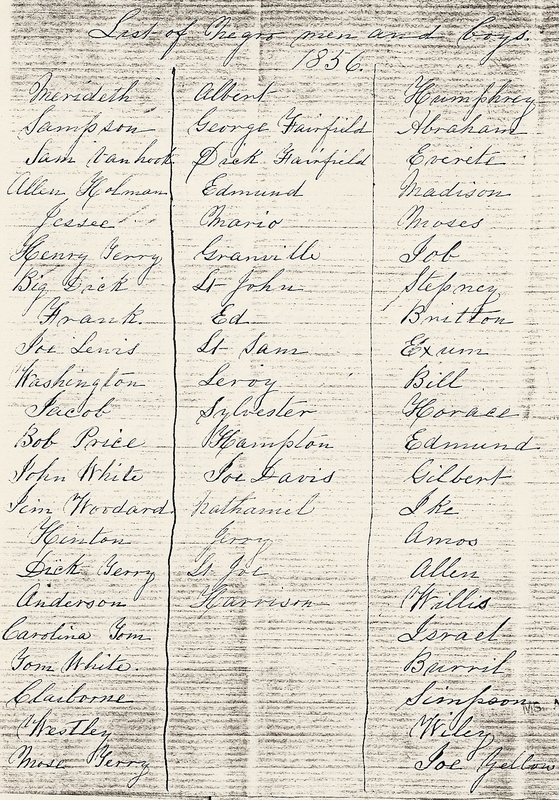 The document above is a list of enslaved African American men and boys on Wessyngton Plantation in 1856 owned by George A. Washington. Slave owners had to pay taxes on their slaves from age twelve to fifty, so the list only identifies those in that age range who were a part of the plantation labor force. 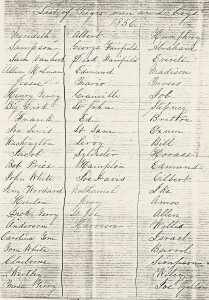 Many of the individuals are listed with surnames: Davis, Fairfield, Gardner, Holman, Lewis, Price, Smith, Terry, Vanhook, White and Woodard. The use of these surnames made it possible to locate them and their previous slave owners. Many of them were also found on the 1870 U. S. Census living on or near Wessyngton Plantation. In 1964, the Washington family deposited all their family papers and plantation records in the Tennessee State Library and Archives in Nashville. Hundreds of these documents shed light on the lives of hundreds of African Americans enslaved there.